U.S. Department of Agriculture (USDA) scientists have given the Newcastle disease classification system a much-needed update, making it easier to identify virus types. Read the magazine storyto find out more. ARS researchers have developed new information to help improve protection of poultry from Newcastle disease viruses, including when to vaccinate chicks.Click the image for more information about it. Exotic Newcastle disease, an extremely virulent form of the virus, is not found in poultry in the United States but is widespread in Asia, Africa, Mexico and many countries in South America. 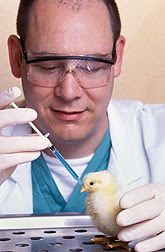 It affects chickens and other bird species, and is often fatal, killing about 80 to 100 percent of unvaccinated infected birds. At the Agricultural Research Service (ARS) Southeast Poultry Research Laboratory (SEPRL) in Athens, Ga., microbiologist Claudio Afonso, veterinary medical officer Patti Miller and their colleagues examine genetic differences in Newcastle disease viruses from other countries, characterize them, make sure existing tests and vaccines are effective, and work on strategies to develop better vaccines. In addition, they evaluate systems used to classify virus isolates. Afonso recently proposed a new classification system to group Newcastle isolates. Traditionally, two systems were being used simultaneously to classify isolates into lineages or genotypes. This caused confusion and sometimes incorrect classification of isolates. The new single system, which is detailed in research published in Infection, Genetics and Evolution, is reliable and consistent and can be used by any laboratory worldwide. SEPRL scientists also evaluate the ability of current vaccines to protect against emerging Newcastle viruses and help the poultry industry test improved vaccines. In other research, Miller is studying the role a bird's immunity plays in virus transmission, protection against disease and relationships between genotypes. Her recent finding, published in Developmental & Comparative Immunology, suggest that an earlier onset of immunity may be necessary for future vaccines to protect against transmission and spread of Newcastle disease.